Difficulty: Marblehead Rail Trail; Easy. Flat, stone dust rail trail. Salem Bike Path; Easy. Flat, paved rail trail. To start from Roundhouse Road parking lot; From Route 128 take exit 26 to Lowell St and travel east towards Salem. Continue straight on Main St then Boston St. Turn right on Essex St then left on Jackson St. Follow to Jefferson Ave and turn right. Follow to traffic circle and turn left, then bear right on Loring Ave. Turn right on Lafayette St (Route 114) and follow into Marblehead. Continue straight on Pleasant St for 0.7 miles, then take a left onto Bessom St. There will be a public parking lot on your right on Roundhouse Rd. The trail starts left across the street at the yellow cable. Note; MARBLEHEAD CYCLE is just up Bessom St. The two trails that make up the Marblehead Rail Trail are abandoned railroad lines of the Eastern Railroad Company. The Salem Spur follows a line built in 1839 from Marblehead towards Salem. In Salem it becomes the Salem Bike Path. The Swampscott Spur follows a line built in 1873 from Marblehead towards Swampscott. The lines were abandoned in 1959. Both trails start from the Roundhouse Road parking lot before splitting off just up the trail. For more information check out; EAST COAST GREENWAY . Starting from the Roundhouse Road parking lot; Pass through the yellow gate and follow the stone-dust trail underneath the Village Street Bridge. You come to an intersection by an electrical station after 0.2 miles. Note; Heading right takes you along the Salem Spur towards Salem. Head left past the sub-station along the Swampscott Spur. This trail travels along a residential corridor and crosses Maverick St followed by Pleasant Street at 0.6 miles. Cross-walk, however, Use Caution as this is a well traveled road. Note; See below for an on-road detour around Marblehead Neck from here. After crossing Smith St you'll pass by Marblehead High School. At 1.6 miles the trail continues straight utilizing a paved driveway past Temple Emanu-El out to Clifton Ave. Across Clifton St the trail is partially developed consisting of a narrow hard packed dirt surface. Cross Rockaway Ave and after 1.9 miles you'll pass a side trail on your right leading to the Ware Pond Conservation Area . Look left to spot some old cement RR rail tie holders. Come to Seaview Ave at 2.1 miles where the trail becomes overgrown. 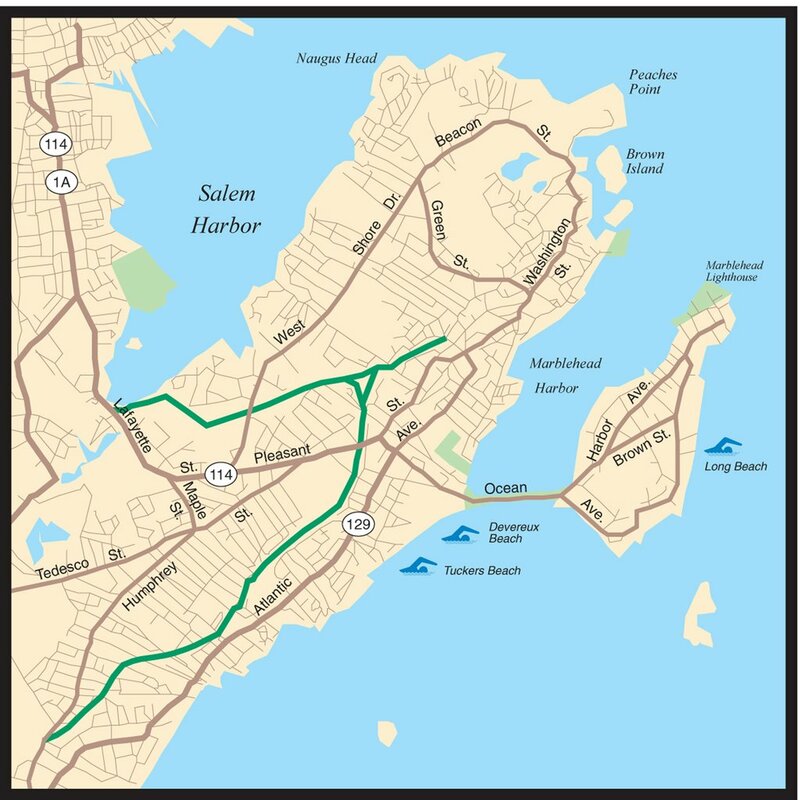 Note; The town of Swampscott continues to push for a continuation of this trail, but as of April 2013, the future Swampscott Rail Trail is still not on the drawing board. Starting from Roundhouse Road parking lot; Pass through the yellow gate and follow the stone-dust trail underneath the Village Street Bridge. You come to an intersection by an electrical station after 0.2 miles. Note; Heading left takes you along the Swampscott Spur towards Swampscott. Head right past the sub-station along the Salem Spur. This trail follows an open corridor along a power line and is more isolated then the Swampscott Spur. Pass by the hiking trails of the Hawthorn Pond Conservation Area followed by Tower School before coming to W Shore Dr at 0.8 miles. Cross-walk, however, Use Caution as this is a busy road. You now pass through Wyman Woods Conservation Area . Travel alongside Salem Harbor and across a bridge over the Forest River before coming to Route 114 in Salem at 1.5 miles. Turn right to access a cross-walk over this very busy road. USE CAUTION. This is the start of the paved Salem Bike Path. This residential corridor travels past Jackman Field, where you'll find a spur trail on your left that leads to an overlook of the Old Creek Salt Marsh. You then travel past Salem State University before a cross-walk over busy Loring Ave. Use Caution. Come to Canal St at 2.2 miles where the trail currently ends. The town of Salem is considering continuing the paved trail north into downtown Salem, but as of October 2013, nothing has been finalized. While you are in the area, I would suggest an on-road bike tour of Marblehead Neck. Very scenic. From Pleasant Street/Swampscott Spur head left on-road along Pleasant St. Take your second right onto Ocean Ave. After 0.7 miles you'll cross a causeway with a view to your left of scenic Lady's Cove/Marblehead Harbor and its 1,600 moored boats. This brings you to Marblehead Neck. Continue right along Ocean Ave. After 2.3 miles you'll pass a side trail that leads to Castle Rock before coming to the intersection with Harbor Ave at 2.4 miles. Continue right along Ocean Ave which becomes Follett St. This brings you to Chandler Hovey Park and its lighthouse at 2.8 miles. Great views of Salem Sound and the Massachusetts Bay. Return via Kimball St and Nahant St (one-way) back to Ocean Ave. Head right and continue straight onto Harbor Ave. This will bring you back to Ocean Ave and the causeway at 4.1 miles. Retrace your route back to Pleasant St and turn left to rejoin the Swampscott Spur after a 5.1 mile loop. For more information visit; MARBLEHEAD .